We are capable of fixing all types of drywall issues and our trained professionals will ensure that everything gets done properly the first time. Let us take the guess work out of your next drywall repair project. We hired The City Painters to paint our house and also fix a large hole in our basement wall. The painters were able to complete the job on time and I was very impressed at how clean my basement was when they were done. They cleaned after themselves each night before they left which was also nice. We recently had our house painted and it looks great. The walls were in really bad condition but they made them look new. We are really happy with the way everything turned out. CONTACT US FOR A FREE DRYWALL REPAIR OR PAINTING QUOTE TODAY! A hole in a wall is not uncommon and we see these types of repairs quite a bit. Stuff happens but these holes can be fixed relatively easily. 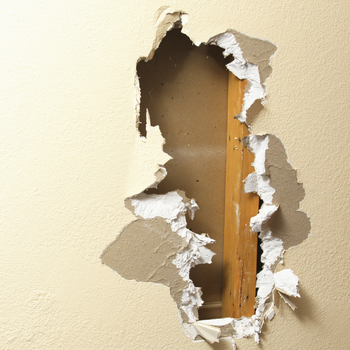 Here’s how you can fix that drywall hole yourself. Prep the Area– Remove any loose drywall from the hole and sand the edges of the hole well. Attach a wall patch– Wall patches can be purchased at most hardware stores and are fairly inexpensive. Ensure that your wall patch will completely cover the whole and apply the sticky side to the hole. Ensure that the patch extends at least half an inch around the hole. Apply drywall compound– Using a putty knife, remove the compound from the container and start applying it to the patch. It’s easiest to start around the edges of the hold and work your way in. Smooththe compound out as much as possible during the application process. This will limit the amount of sanding you will need to do later. Allow the compound to fully dry.